U.N. Secretary-General Antonio Guterres says the U.N. is working hard to ensure peace talks on Yemen before the end of the year. Talks are tentatively set to open next week in Stockholm between Yemeni officials and representatives of the Iranian-backed Houthi rebels. Guterres said at the Group of 20 (G-20) summit Thursday in Buenos Aires that "a number of setbacks have taken place" and he does not want to raise expectations. But he said he is hopeful something will happen before the end of 2018. A Houthi spokesman said Thursday his side will come to Sweden for the talks next week if their safe passage is guaranteed. Michael Aron, British Ambassador to Iraq, speaks to the media in Baghdad, May 24, 2012. British Ambassador to Yemen Michael Aron said he sent messages to the head of the Houthi delegation and Yemen Foreign Minister Khaled al-Yemeni, telling them he has already booked his travel to Stockholm and looks forward to seeing both of them there. "The political solution is the way forward and these consultations are a great step forward," Aron tweeted. Also Thursday, U.S. Ambassador to Yemen Matthew Tueller said Iran is one of the major forces trying to stir up instability in Yemen and "throwing gasoline on the fire" across the Middle East. "Step back for a moment and look at what we have in Yemen. We have a non-state actor, a militia, that has overthrown the government, and yet it is receiving arms, equipment and support from a state, Iran," Tueller told The Associated Press. 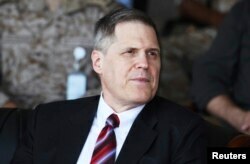 Matthew Tueller, the U.S. ambassador to Yemen, attends a military ceremony in Mukalla, Yemen, Nov. 29, 2018. Iran has denied sending the Houthis weapons through the rebel-controlled port of Hodeida, where some of the fiercest fighting is concentrated. Airstrikes fired against the rebels by a Saudi-led coalition have killed thousands of civilians. A State Department spokeswoman announced Thursday the U.S. is sending another $131 million in emergency food aid to Yemen, bringing the total over the past 14 months to nearly $700 million. "Ultimately, no amount of humanitarian or development assistance will end this conflict. All parties must cease hostilities and support negotiations. ... It is time to replace conflict with compromise and allow the Yemeni people to heal through peace and reconstruction," a State Department statement said.